LOUISVILLE, Ky. — Agriculture Commissioner James Comer today presented a check for $1.65 million to Kentucky State Treasurer Todd Hollenbach for deposit into the Commonwealth’s General Fund. 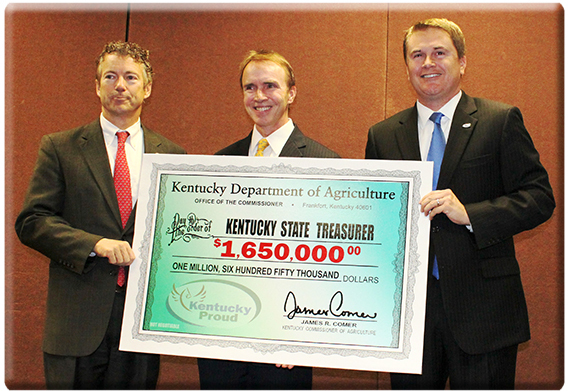 Commissioner Comer was inspired by U.S. Sen. Rand Paul to conduct a check presentation to demonstrate proper stewardship of taxpayer dollars and show in concrete terms how he has turned the department around in less than two years. Commissioner Comer asked Sen. Paul to join him for the check presentation. Comer closed the fuel lab in March, terminated all but one of the employees who staffed the lab, and privatized the state’s motor fuel testing, saving the state treasury an estimated $600,000 a year. At his request, the state Finance and Administration Cabinet auctioned the lab equipment in September, recovering $2.14 million in the two-day sale — more than the original value of the equipment.